Our Plant Design and Environmental Plant Specialists work with office and property managers, HOA boards, homeowners, Interior designers, business administrators, and wedding planners at all levels of complexity and budget. 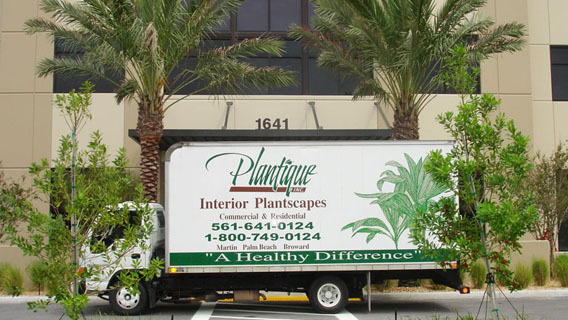 We install and maintain plantscapes for interior and exterior entrance areas, atriums, balconies, patios, terraces, decks and any area where plants can improve the human outlook, quiet spaces, and clean the air. We use only those plants that will make a statement and hold up to the sensitive environments. Seasonal flowers are often used in combination with hardy foliage plants. Healthy indoor plants custom-fit to the light, traffic and style of your unique space. Consistent quality installation and maintenance from a professional experienced horticultural service technician. Seasonal exterior color bowls and plant beds that provide a warm, welcoming appearance for entryways, patios, courtyards, and pool decks, professionally installed and maintained. Vertical gardens of living plants that provide temperature and sound insulation, and purify interior air. Living walls and moss panels created by artisans and installed by specialists. Orchids and bromeliads always in bloom delivered every 4 – 6 weeks with maintenance every 2 weeks between changes. Plant rotation as needed or on request. For wedding and event planners, live plants define spaces and set a mood. Plants disguise, cover, and distract from a myriad of space imperfections. They dictate traffic flow and keep the air smelling fresh and clean. The use of plants in a venue solves so many issues, it’s one of a planner’s first considerations. Want to inject a breath of fresh air into a wedding? Swap fresh flowers for potted plant rentals! It’s a growing trend among eco-friendly couples and budget-conscious minimalists. Line the church aisle with low trees or potted plants or create a lush, colorful background for the marriage ceremony. Hide unsightly areas of the reception hall and create walkways, barriers, and borders throughout your venue. Use just a select few cut flowers amid tall, thin containers of greenery or select towering orchids for tables. Small succulents can hold place cards for guests and double as a guest favor. Make the holidays last from Thanksgiving to Christmas. Deck the halls with container plants and berries that last long after the holidays. Choose from our pre-designed themes or work with our designers to create your own with living trees, wreaths, sprays, garlands, and swags for Christmas, Holiday, or Hanukkah. Enjoy seasonal displays without the stress of installation, removal, or storage. From the initial design, installation and removal of the last item, Plantique makes celebrating the holidays an easy way to brighten your home or business. Ask us how we can help you provide a more beautiful, relaxing, healthier world with plants. 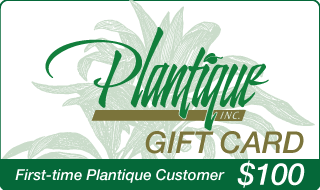 Ask for your $100 Plantique Gift Card valued at $100 toward future purchase of plants or planters or Interior Plant Care Program.